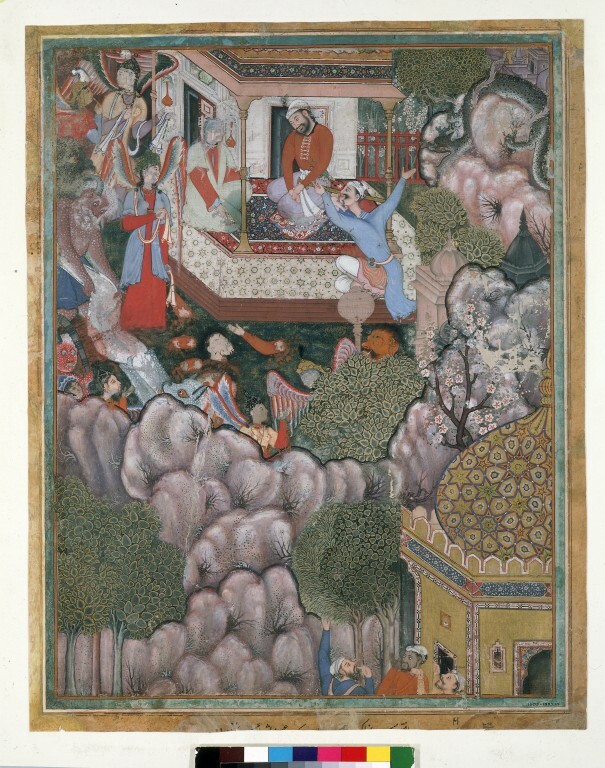 The Hamzanama, or 'Book of Hamza' was commissioned by the great Mughal emperor Akbar in the mid-16th century. The epic story of a character based very loosely on the life of the uncle of the Prophet Muhammad chronicles the fantastic adventures of Hamza as he and his band of heroes fight against the enemies of Islam. The stories, from a long-established oral tradition, were written down in Persian, the language of the court, in multiple volumes. These originally had 1400 illustrations, of which fewer than 200 survive today. Work probably began in about 1562 and took 15 years to complete. In this illustration, Hamza is deep in coversation with a demon called Hura, unaware that a dragon is approaching from behind rocks to the right. Hamza's close companion, Umar, gesticulates wildly to warn Hamza. To the left, demons tear apart an unknown creature, throwing severed limbs and a head to the ground, ignored by the peris (or fairies) who stand around them. Hamza is deep in conversation with Hura the genie as they sit together on the terrace of a pavilion, unaware that a dragon is approaching from the right. Hamza's companion, Umar, gesticulates wildly to try to warn Hamza. To the left, fairies (peris) stand and watch the scene impassively, ignoring the spotted demons in their midst who tear a creature in half, and the limbs and head that have been thrown on the ground. Bought by Caspar Purdon Clarke in Srinagar 1881. His Portfolio essay (p. 3) states: 'Twenty-four of these [illustrations to the Hamza nama] were purchased at Srinagar, Kashmir, in 1881, where they were discovered, by the late Sir C. Purdon Clarke, in one of the picturesque wooden huts on the Hawa Kadal Bridge spanning the River Jhelum. Several of the badly damaged specimens were rescued from the lattice-windows of the humble curiosity-shop, over which they had been plastered by the vendor during the previous frosty season. It should, however, be explained that the numerous greyish-pink smudges which, alas, replace human faces in the paintings, are the result of Moslem fanaticism'. 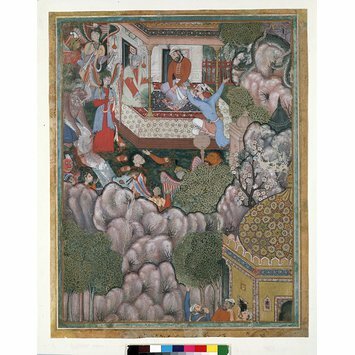 The production of the illustrated volumes of the epic romance the Hamzanama, or 'Book of Hamza' was the first major project commissioned by the young Mughal emperor Akbar after his accession. The work was directed by two Iranian masters brought to Hindustan by his father, Humayun, and took fifteen years to complete. Hamza converses with Hura the genie while a dragon approaches. Hamzanama ca.1562-77. C. Stanley Clarke. Indian Drawings. Twelve Mogul Paintings of the School of Humayun (16th century) illustrating the Romance of Amir Hamzah. Victoria and Albert Museum Portfolios, London, 1921. Seyller, John. The Adventures of Hamza. Smithsonian Institution. 2002, cat. 20, pp. 84-85.
p. 14, cat. no. 6.